We weren’t all that innocent. Not like the media would have you believe. We already had rock ‘n’ roll, the very name of which implies a loss of innocence. We had Elvis, though he wasn’t someone who excited me. I was a little too young to fully appreciate what an older sibling Elvis fan might have liked about him. Instead, I counted Del Shannon’s Runaway among my favorite songs. Having memorized the lyrics, I’d sing it aloud bicycling around the neighborhood. Over time, Gene Pitney’s Twenty-Four Hours from Tulsa took over the top spot in my “bicycling aloud” repertoire. The lyrics to both songs were emblazoned on my brain. To this day, I still play and sing them whenever the urge to pull out my guitar creeps over me. Only rarely do I sing either of them aloud anymore while bicycling. That internal playlist changed on the day I accompanied Mom to the Bonnie Bee Supermarket. I always enjoyed going to the grocery store with her because I’d get to hang out in the magazine aisle and leaf through the latest issue of Song Hits magazine. Occasionally I’d make a halfhearted attempt to scan Hot Rod magazine. What captured my attention on this day, however, was a nearby record rack that housed the week’s top ten hits on 45s. I’d seen picture sleeves on records before. Some singles by the Beach Boys had them. There were other groups with picture sleeves as well. On this day the one that attracted me had on it a black and white photo of four guys in collarless jackets, the guy on the left sporting a lit cigarette in his fingers. These were the Beatles I’d been seeing on television news and was hearing on the radio. 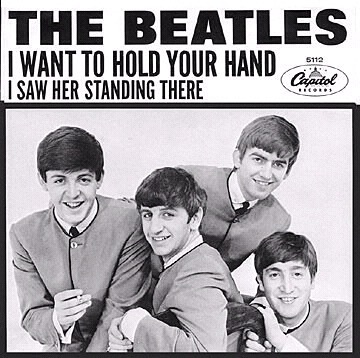 That sleeve containing their record, I Want To Hold Your Hand, called out to me. I walked down one aisle after another, record in hand, to find Mom. If I could just sneak it into the cart unnoticed, I’d nonchalantly slip it on to the conveyor belt at the checkout as I helped unload groceries. I chickened out and simply asked her if she’d buy it for me. My reasoning must have been sound. In 1963, Mom bought me the first Beatles record I ever owned. See the film. If you’re so moved, post a comment about your first memorable Beatles moment. And by the way, thanks Mom! < Previous Put me in, Coach!